This was a quick read, probably because I simply couldn't put it down. I was sucked into the story right away and stayed there until the very end. 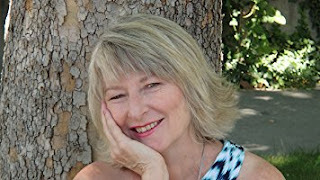 I love these sweet historical romance novels, especially when you find an author who knows how to develop the characters to be someone with whom you can truly find a connection. Abigail Mary Vaughn has spent most of her life caring for her elderly parents. When they die, Abby finds herself quite alone. When she decides to reply to an advertisement for a bride, she soon finds herself traveling from Philadelphia to a small town in Texas. Brant Samson, who lost his wife a couple of years earlier, was doing his best to raise his three children and run his ranch. Although the attraction was immediate as Abby stepped off the stagecoach, the romance built slowly, and was beautifully written. Aside from the beautiful romance that developed, this was a story about loss and letting go. A story about holding past loved ones near your heart but continuing to live your life and finding that you can love again. There are moments of great joy in this novel, but there are also moments of great tragedy. If you don't have a box of tissues handy, I suggest you not read this until you do. This is at least a 3 tissue read! So be prepared. It does end with a HEA (happily ever after, for those of you who don't know what that means), but I don't want to give up any spoilers. This is the first book I have read that was written by Verna Clay and I must say that I am intrigued. Yes, I love historical romance, but I especially love a book that brings the characters to life for me. And Verna Clay does this beautifully. After getting a sneak peak at the next book in this series, I know that I will be reaching for another one very soon. 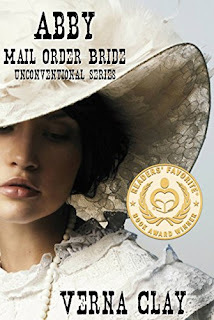 "2014 Gold Medal Winner: Readers' Favorite International Book Contest/Historical Romance for ABBY: MAIL ORDER BRIDE."